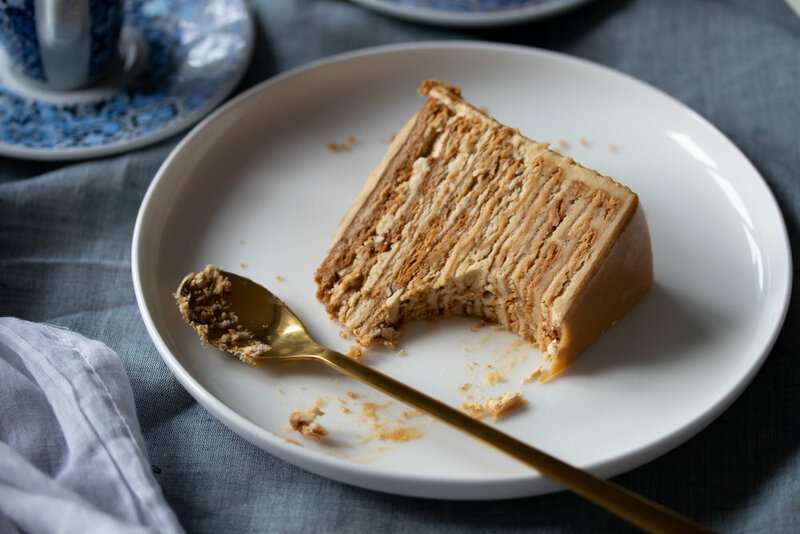 This is my take on the delicious, popular Portuguese biscuit cake - alternating layers of Marie biscuits soaked in strong coffee with sweet, rich buttercream. YUM! Strictly speaking, the buttercream for this cake is usually egg yolk based and the shape of the cake most often free-form (think seven little biscuit towers forming a pretty flower shaped cake). However, I favour this coffee & vanilla Swiss meringue buttercream recipe as it is silky, rich but not too sweet and I find using a cake ring easier for assembly. If you are a purist at heart (or couldn't be bothered with the glaze), simply decorate the outside of the cake with flaked or slivered almonds instead of glazing it. To start, make the Swiss meringue buttercream by placing the egg whites and caster sugar in a large heat proof mixing bowl (I use a stainless steel free standing mixer bowl). Set it over a medium saucepan of simmering water (making sure the surface of the water does not touch the bowl). Whisk by hand for a few minutes until the sugar has dissolved (you can test this by rubbing a bit of the mixture between your fingers - when ready, is should not feel grainy anymore) and the mixture feels warm to touch (about 65°C on a thermometer if you are unsure). Note: You are not trying to whip the meringue at this stage but instead just dissolve the sugar and cook the egg whites gently. Remove from the heat and whisk on a high speed with electric beaters or an electric mixer until the meringue is stiff and glossy. Add the icing sugar (sifted) and beat until uniform (slow at first to prevent being engulfed by a cloud of icing sugar). If the meringue still feels very warm, slow the mixer to a medium speed and whisk for a few minutes until the mixing bowl is cooler to touch (i.e. the meringue reaches room temperature). Add the soft, room temperature butter and whisk on a high speed until smooth and glossy (at least 2 - 3 minutes). Once the buttercream is smooth, add the salt, vanilla bean paste & espresso and mix until uniform. (If after several minutes of mixing the mixture seems split, the butter might be too cold - warm the mixing bowl gently using a bain-marie then whisk again on a high speed. If the buttercream looks very runny, the butter or the meringue might be too warm - cool the mixing bowl for a few minutes in the fridge, then whisk again on high). I've used a cake ring to assemble the cake, but you can easily do it free-form (which is traditional). If you are not glazing the cake, you can omit the cake board and assemble the cake directly on your serving dish or plate. To assemble, spread a thin layer of buttercream over a disposable cake board (I've used a 15cm round cake board). Place a same size cake ring over the cake board. Soak one or two biscuits at a time in the cooled coffee for a few seconds (enough to slightly soften them but still holding their shape - it is a fine balance...). Place a few soaked biscuits on the board to fit. Spread a very thin layer of buttercream over the first layer of soaked biscuits. Repeat the layering until all the biscuits are used (or until you are happy with the cake's height). Refrigerate the cake for an hour or two (or if you have the patience, overnight). Remove the cake ring (a little bit of heat on the outside of the ring with a blow torch really helps). For a sharp finish (especially if glazing the cake), you can spread a thin layer of left over buttercream (if you have) over the top and sides. Place the cake back in the fridge while you prepare the glaze. To make the white chocolate coffee glaze, place the white chocolate and cream in a heat proof mixing bowl and set it over a medium saucepan of simmering water (making sure the surface of the water does not touch the bowl). Whisk occasionally until all the chocolate is melted and the mixture is smooth then remove the bowl from the heat. Add the espresso and combine until smooth. Place the gelatin sheet in a bowl of cold water to hydrate (add a few ice cubes to ensure the gelatin sheet does not melt when hydrating it). Once the gelatin is soft (allow a few minutes in the cold water), remove the soft sheet from the water and give it a squeeze to remove the excess water. Place the gelatin in the white chocolate coffee mixture and whisk a little until the gelatin has dissolved. Pour the mixture through a fine sieve into a large jug or bowl and leave it to cool to 30°C (if you do not have a thermometer, when ready to use, it should have the consistency of pouring yogurt). Once the glaze is a the correct temperature/consistency, remove the cake from the fridge and place it on a wire cooling rack or bowl over a baking tray or dish. Pour the glaze over the cold cake and leave it for 5 minutes or so in order for the glaze to set. (Any left over glaze can be stored in an airtight container in the fridge for up to a week and reheated gently in a bain-marie in order to reuse). Transfer the cake to a serving plate. 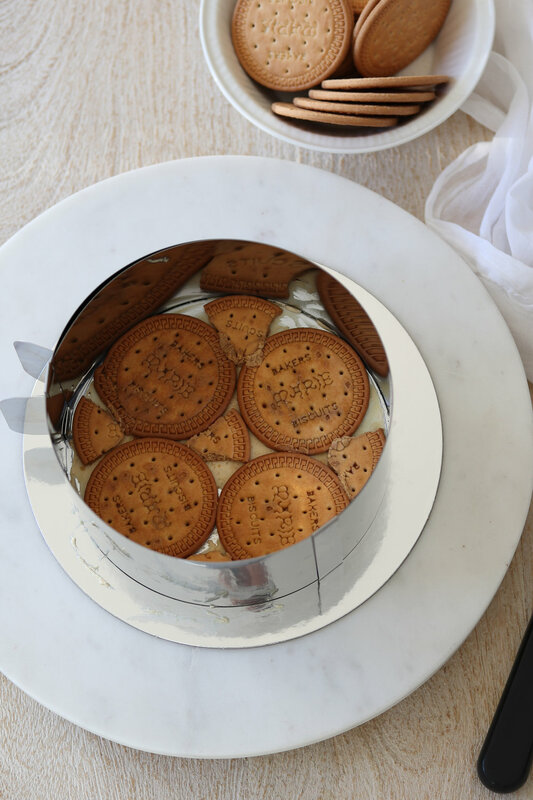 Decorate the bottom rim with crushed biscuits and a Marie biscuit on top (blob a little buttercream behind the biscuit to help it stay upright).